Apparently, ugly christmas sweaters will never go out of style (is "in style" the right term?). This year, Rent the Runway is even offering ugly Christmas sweater rentals! However, at $15 a rental, that seems like a lot to pay when you can buy a perfectly good (bad?) ugly Christmas sweater of your own for under $30. A sweater you'll have the pleasure of wearing year after year to embarrass both yourself and loved ones at family events and parties. 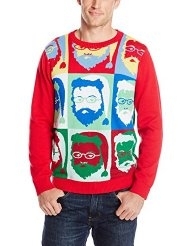 If you're looking for ugly Christmas sweater ideas (or a non-sectarian ugly "holiday" sweater), Amazon once again has an Ugly Christmas Sweater sub-category, filled with the best (worst?) selection of holiday-themed sweaters. Both men and women will be suitably pleased (disgusted?) by the selection of fashion masterpieces. Our Jewish readers will find the ugly Hanukkah sweater selection at Amazon less robust. But what it lacks in quantity, it surely makes up for in quality. Wishing everyone a tacky holiday season! You need to check out tipsyelves.com. It is hysterical. Their story is pretty interesting as well. They were on Shark Tank. I saw Tipsyelves.com when I was researching the story. All of their products are sold on Amazon and you get free shipping (vs $5.95 and up on Tipsyelves.com), so I thought it made more sense to point people there. Hope they did well on Shark Tank! Any local thrift store is sure to have a low priced selection of holiday themed sweaters of varying degrees of pulchritude. I have two not bad looking ones for which I paid 50 cents each. Help a local charity and save money. Where do you think those online stores buy theirs? Not a bad idea for a sweater you may only wear once or twice a year, plus they may have a certain “retro” appeal. Though, it is different than the online stores, which are only selling new products.